Getting the best soundbar under 100 dollars isn’t easy, and it can be difficult to know where to start. In the last couple of years, soundbars have become increasingly popular. This is probably due to the fact that televisions are becoming more advanced and streamlined, leaving them incapable of producing a great quality of sound. If you like listening to loud music and watching action movies but you haven’t got the budget to be investing in ceiling speakers and expensive subwoofers, then you’re in right place. I’m here to help you find the best soundbar under 100 bucks so that you don’t waste your time and money on something that won’t improve the quality of your listening experience. Whether you’re after a soundbar for your TV, your laptop or just a portable one for carrying around with you, I’ll give you a solid option for each of these categories; all at a bargain price. What does 2.0 and 2.1 channel soundbar mean? What wattage soundbar do I need? How to connect my soundbar to TV without an optical cable? Now, in all honesty, a soundbar isn’t really the kind of thing that you want to skimp on. If you do have the budget, then you’d be better off going for something like a Klipsch or a Sonos. There is a big difference in quality, but of course, there is a massive difference in price (some Sonos soundbars are into the thousands!). Whilst you don’t need to spend thousands to get a good sound system setup at home, it’s worth considering if you do have the extra cash lying around. If not, then I’ll help you out with the best bargain soundbars that you can find. Whilst Taotronics might not be the first name that you think of when it comes to sound equipment, it’s difficult to argue that they have been destroying the budget market over recent years. While their products definitely don’t hold the prestigiousness that brands like Polk or Yamaha do, that doesn’t necessarily mean that you aren’t getting a quality product. They still produce some of the best budget sound equipment I’ve seen. They have found their niche within the market and have become one of the best selling brands around. But what makes this soundbar particularly attractive? Well, there are a few features that I think separates it slightly from it’s competitors. It covers all the bases in terms of having a remote control and being able to use it both bluetooth and wired, which is a must for me. Internally, it has two passive radiators that deal with the low frequency sounds and four speakers to deal with everything else. These passive radiators work well and the air flows through pretty slowly, so it can deal with sub-200 Hz sounds well. Along with those features, I just feel that this soundbar is finished extremely well and it looks much more expensive than it really is. The metal touch-pad is a nice addition that really adds a nice aesthetic to the overall finish. The quality that this soundbar emits is definitely similar to that of other more expensive competitors. The audio is extremely clear, and unless you like playing everything at full blast 24/7, you’re unlikely to get any distortion or unnecessary hissing. The setup of this soundbar is almost ‘plug and play’. You can have it completely set up within a few minutes if you know what you are doing, and if you don’t, then the 8 page manual it comes with should give you a great idea of what you need to do to set it up. It’s pretty thin and compact for a 34 inch long soundbar; usually I’ve found a lot of them to be just big and bulky, which can be frustrating. It is also surprisingly lightweight for it’s quality and build, which is nice. Probably the most annoying thing about this soundbar is it’s interactivity with your television. For example, if you put your TV on standby, then eventually the soundbar will also go into standby too. But when you turn the TV off standby, the soundbar doesn’t automatically turn on. This can be kind of annoying having to turn the soundbar post standby every time, but maybe it’s just me that this would annoy! Although the sound quality is good and it does seem pushing it a bit to ask for a soundbar with high quality a built in subwoofer under $100, I do wish that built-in feature would be a bit better, as the passive radiators aren’t amazing. For me, this would elevate it to that next level. I do listen to a lot of low frequency music though, so maybe I am biased. This Taotronics soundbar is almost certainly my favorite option under $100. Cheap price, great sound; what more could you want? One thing that I really like about this soundbar is that it’s compatible with SD cards, as well as the standard wired connection and of course, Bluetooth. It isn’t easy to find a soundbar that is memory card accessible, so to find one for this price is pretty amazing. Along with the memory card, the best thing about this soundbar is the budget price that pretty much anyone can afford. 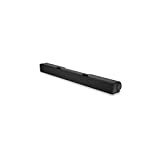 To be truthful, that is the only reason that this soundbar made the list; at the time of writing, you can pick this soundbar up for less than $40. If it is any more than that, you should consider shopping around for something a little better. To sum this one up, it’s a great option if you’re on a super tight budget and you can’t afford to pick up anything else. It’s also a good temporary option if you just need it for a month or so whilst you are waiting to install some in wall speakers. The price is undoubtedly the best thing about this one; you can pick up like 20 or more of these for what it will cost you to get one Sonos soundbar, which is a bit ridiculous if you really think about it. If you need to kit your entire house out musically, then it’s important to keep the budget down. These speakers would be a great option for your kids room or occasional use. Sound quality is quite honestly, average at best. You can’t argue at this price as it will definitely be a one up on your television speakers, but don’t expect to be blown away. Although you might like it, I actually don’t like the design of this soundbar one bit. It looks kinda cheap and tacky to me, but I guess that is down to opinion only. This Dell soundbar is really cheap – and that’s about the only good thing about this one! Now, I know what you’re thinking; why have you included an Amazon Basics product in here? Well, it’s important to remember one thing about Amazon Basics. Don’t be put off by the brand name. People get the idea because it has “Amazon” and “Basics” in the name that it’ll be super cheap quality; this isn’t the case. In reality, Amazon are one of the biggest retailers in the world, so they know each industry inside out. Often, they can measure the competition and produce the same quality products for a fraction of the price. 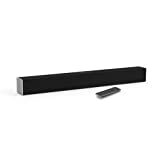 This Basics soundbar is a good example of a product that is based on what their competitors have produced, but with a few improvements. One thing that I particularly like about this one is that it’s extremely easy to install, which is something that is important to me as I don’t like wasting time reading long winded, confusing manuals that don’t make any sense. It is a nice, subtle design that packs a decent amount of power for a sub 32 inch soundbar. It’s also 25 watts, which is a fair amount and will definitely be able to produce a loud enough sound for your living room or bedroom. It’s unlikely you’ll need anything louder than this, unless you want to create a home cinema, then you might need to consider a different set up altogether. In general, people are hyper critical of Amazon products, usually due to their own personal preconceptions (inclusing myself). Though I have to admit, if you give their products a chance, sometimes they might surprise you. Of course, as it’s an Amazon product, you get an amazing warranty, which might be the deciding factor for many people. Maybe I am hyper critical of all this audio equipment because I am constantly listening to music or watching films. In reality, the sound quality from this soundbar is pretty good and you’ll definitely see a massive step up from your television speakers with this one. The soundbar itself is very subtle. In general, soundbars do tend to be a more subtle part of any audio setup, but the Amazon Basics model is particularly designed to blend in with everything else and go completely unnoticed. The installation of this soundbar should be extremely easy for anyone who has had any experience with anything technological before. If not, you shouldn’t have any problems with the user manual, either. Usually, my main criticism of a cheap soundbar is that it doesn’t deliver the bass, low frequencies sounds as well as it should do. But with this product, I actually think that the highs is where it slips up slightly. At louder volumes, you might find that it becomes somewhat tinny and distorted, which isn’t good for a soundbar of this price. It is definitely a step up on your TV speakers, but not what it could be in my opinion. The soundbar has a specific ‘movie mode’, which is quite honestly a complete waste of time. It isn’t much different than the standard mode, which is fine to watch movies in anyway. A solid option for those who are looking to avoid paying extra for big brand names. If you’re looking to add a soundbar with a little style, you’ll probably want to pair your soundbar up with a mount. This can make it look much for aesthetically pleasing. Doing this won’t just improve it by making it visually more appealing. It can also enable the soundbar’s output to be heard throughout the lounge, as the placing of your soundbar is pretty important. If you place it incorrectly, you won’t be taking full advantage of your soundbar. You probably haven’t heard of Mighty Rock as a brand, and that’s okay. They aren’t as prominent as other brands in the market, but some of their products are pretty awesome, including this soundbar. It includes dual 15 watt speakers, which give it a decent volume that will definitely be enough for your lounge or any room in your home. It won’t be enough to give you a full home theater experience in my opinion. If you want this, then you should look at going for some in wall speakers or larger center channel speakers. Though it might not have the overall power to compete with some other speakers, it’s a good option if you are looking for something portable that you can link your mobile phone up to easily. At 30 inches it isn’t too long, and it only ways 4 or so pounds so it is fairly lightweight. The signal strength is also good, so it would make an ideal option if you’re travelling a lot. Overall, this would be a good option if you’re after a good soundbar that won’t cost you an arm and a leg. It’s slim and lightweight, making it a great option if you are looking for something that is portable and easy to move around. The Bluetooth connection works extremely well and is quick, which is often an issue if you’re looking at cheaper range audio products. You don’t have to worry about that if you go with the Mighty Rock; it’ll connect to your mobile or tablet in seconds via Bluetooth. The EQ modes actually make a difference on this soundbar and they are definitely a necessary feature. Unlike pretty much every other soundbar that we’ve listed, the manual to this one is actually super complex and isn’t particularly easy to read. If you’re technologically minded then this won’t be too much of an issue for you, but if you’re not then you might find it a bit difficult to get to grip with this soundbar. Don’t expect the best quality out of this one; the high frequencies it emits aren’t on par with some more expensive models on the market. For it’s price though, it is pretty reliable, but it won’t blow you away. At 30 inches, this soundbar from Mighty Rock would be a great option for smaller TVs in your home. This is one of the longer soundbars on the market, coming in at a whopping 36 inches. 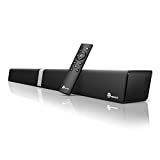 It’s specifically designed to suit 36 inch or bigger televisions, as it’s difficult to find a soundbar that can give a powerful sound like the KY-2020. Probably my favorite thing about this one is that it has dual subwoofers built-in. Yes, that’s right, and if you know me and how much I like my bass, then this is of the utmost importance to me. As subwoofers deal with any frequencies between 20 Hz and 200 Hz, then it’s a very specific pressure that must be released to get a completely distortion-free sound out of a subwoofer. Having built-in subwoofers is something that is a must for anyone who likes heavy bass and deep music, as it helps to add atmosphere. There’s nothing worse than a speaker that can’t handle low frequencies when you want to listen to some heavy bass. Although personally, I have an in wall subwoofer setup that I’d advise you to look into. 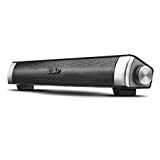 Anyway, technically I think that this is a great soundbar for anyone looking for a simple, good quality system that can be used both for Bluetooth and wired connection. Though the wired connection seems to work a bit better, in my opinion. Definitely a good choice for bass enthusiasts and people who listen to music constantly throughout the daytime. Two dual subwoofers is enough to fill the room with sound easily. The quality of sound is fantastic at this price level. I think that you’ll be genuinely surprised if you get this soundbar at the quality that you’ll get, which is really top notch. It’s not just the quality of the sound that is decent; the overall build quality of this speaker is impressive, too. It looks and feels like a much more expensive speaker than it is, and I’m genuinely surprised that you can find it at under $100. One thing that I will say for this soundbar is that it is definitely better for music than it is for films and movies. It doesn’t have any mounting points built into the soundbar, which suggests that it was never designed to be a television soundbar (even though it is advertised as one). If you’re a bit handy with some tools, I’m sure you could build your own stand for it, but otherwise you’ll be left with placing it on the TV stand beneath the television. The remote control isn’t as responsive as we’d like. From a distance, sometimes it fails to work whereas other remotes seem to work from anywhere. I know, it’s a petty negative but it’s a negative nonetheless. The best option if you love your bass; the low frequency sound quality from this one is insane. √ 【NOTE】If you want to hook it up with tv you should make sure it has 3.5mm audio output if the answer is no you could get the 3.5mm Audio female Cable to 2 RCA Male Cable to make it work. Size: 2.4 x 15.7 x 2.2 inches and audio cables are about 4ft long, not big but good for computer or tv. 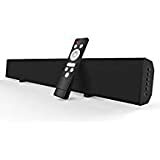 √ 【Crystal Clear Sound】Treble sound fill a room with so much music comes through crisp and clear which provides you a more enjoyable stereo sound experience with this elegant and sleek sound bar speaker. 3Wx2 will be suitable as a computer speakers. √ 【Sleek & Unique Design】Low profile design makes your tv sound bar or desktop speakers more compact and fashionable. Stylish smooth appearance makes you feel all places get organized. Despite what you might think, not all soundbars are made to be used in conjunction with your television. In fact there’s a whole other market for portable and laptop soundbars that has become increasingly popular in recent years. For my money, this is one of the best soundbars for pc and laptop addicts who just aren’t getting the sound that they want from their speakers. This little 16 inch bar is filled with enough power to completely blow your computer speakers out of the water. If you’re often streaming stuff through your Mac, then this would be a good option for you if you want to increase the sound quality of your films. Height-wise, it’s only 2 and a half inches tall, so it should fit under your desktop monitor pretty easily if this is what you want it for. With two 5 watts in built speakers, it doesn’t have the power to fill a room or match any of the other speakers that we’ve listed, but it isn’t intended to either. It’s made for when you’re snuggled up in bed with a film and you want to be able to hear it, or if you’re out for a picnic and want to play some music whilst you eat. You can pick this up in both a wired and bluetooth version, of which we advise you get the latter. Otherwise, it can get pretty annoying having tangling wires everywhere. It will undoubtedly be a massive improvement on your laptop speaker quality. The treble that this thing produces is surprisingly impressive and it handles higher frequency sounds very impressively. At 16 inches, it’s super compact and you’ll be able to fit it into any small rucksack or even your laptop bag. I actually think it’s a really attractive speaker. It’s not built with the highest quality materials so it isn’t luxurious, but for what it’s worth I think it looks pretty neat. I especially like the volume control on the side of the soundbar, which gives it a uniqueness and separates it from other competitors. I guess you could say that the sound quality is pretty bad when compared to other soundbars we’ve listed, but I mean what do you expect? This thing weighs 1 and a half pounds, it’s not built to produce thrilling sounds and heavy beats, so don’t expect it to do this. For the wired version, you’ll need to use a USB to charge the soundbar, and a jack to actually connect the volume. It can be pretty frustrating getting tangled up in wires all the time. Not everyone is looking for a big 30 inch soundbar for their TV, and this one is a good example of a cheap soundbar ideal for a laptop or to be used on the go. My final pick is the VIZIO SB3820-C6, which is definitely one of the most popular products on the current market. It has some really great features that set it apart from other competitors at it’s price. 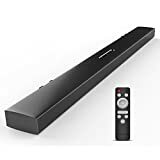 Now, this soundbar does come in a 38 inch size as well as a 29 inch, which is significant more compact and would be a good choice if you have a smaller television. Though for me, I prefer the larger 38 inch size as it produces a lot better lower frequencies than the smaller option. Also, I think it’s far more visually appealing to have a larger soundbar to match a larger TV, of which the majority of lounge televisions are at least 40 inches nowadays. It doesn’t have an in built subwoofer, but it does handle bass relatively well despite this factor. The distortion level is well below 1% and it can belt out 100 decibels, which means that you can have it loud enough to blare throughout your house without worrying about the quality of the sound being affected too much. Overall, I’d say that this soundbar is great value for money, as it isn’t particularly expensive at it’s current market price. The sound quality is excellent, producing rich and clear sounds that will smash your TV speakers out of the water. Over 100 decibels of pure power. Now, it’s not going to win any awards for design, but do you really want it to? There are far better looking soundbars available, but this one manages to fly under the radar with it’s subtle design that won’t interfere with your current setup. The instructions are simple to read, and for it’s size it is pretty easy to mount it on the walls behind your TV. Honestly, at it’s size I do think that it should be able to handle bass a little better. “I thought you said it handles bass relatively well” I hear you ask? Well yes, it does handle bass relatively well; meaning for it’s price, it’s pretty solid for low frequencies. Perhaps I’m too expectant and am used to getting more expensive soundbars, which provide a much better quality for their price. On the odd occasion, the soundbar might turn itself off, which isn’t something that you’d expect for a soundbar of it’s price. If you’re looking for a large soundbar that will fill your lounge with good volume, then this is the best pick for you. Something that’s of primary concern when you’re purchasing a soundbar is making sure that you get the right one for you. This is especially when you’re looking for a cheaper end one, as there are a lot of junk soundbars out there that just won’t produce a decent sound quality. Usually I would advise you go with some of the more reputable brands for audio equipment, like Sonos and Polk. However, if you’re on a budget, you won’t be able to do this as they can cost an arm and a leg. Now, if you’re buying a soundbar for your television, then the size soundbar that you get should be directly related to the size of your television. As a rule, it’s generally consider best practice to have your soundbar the same size, or a couple of inches shorter than your television. For example, if your TV is 40 inches, then a 32-36 inch soundbar would be perfect. If it’s 50 inches, then anything from 38-46 inches would be preferable. This is all down to personal preference of course, but this is what I’ve advised my peers to do with good results. BOTH! Sorry, but this is something that I’m pretty clear about. If you’re investing money into your soundbar, you want it to at least have good Bluetooth signal; this is the least that I ask, and none of the soundbars listed have bad or non-existent Bluetooth. There’s no need to get a soundbar that only does one or the other; why not have both when the majority of soundbars provide this? Now this isn’t the case with all soundbars, but I do recall having one on the past that’s bluetooth connectivity just wasn’t great. It frustrated me so much that I stopped using it, and boy am I glad that it had a wired HDMI connection too. A HDMI connection tends to be extremely secure, which is great if you don’t like any interference whatsoever. First let me just state this; soundbar remote controls are notoriously bad. In fact, it’s kind of an industry joke that the remote that comes with cheaper soundbars is useless. Whilst I don’t agree that they’re useless, they usually aren’t as responsive as your TV remote. Fortunately, none of the soundbars I’ve listed have particularly bad remotes. More often than not, you can set your soundbar up with your television remote to avoid any issues with the remote anyway. I’ve tried to include soundbars in this list that have a front display, as it is one of my pet peeves not being able to see the volume whilst I am adjusting it. If you’re not about that, then you don’t really need to worry about having a front display on your soundbar, as there aren’t many other things that you’ll need it for. Soundbars are not supposed to replace a surround sound system, and in my opinion, you can’t really compare the two as they are designed for different things. Can a soundbar replicate the sound that you’ll get from a good surround sound system? Almost certainly not. It’s impossible for one speaker to recreate the effect of several speakers, which is why surround sound has become so popular. But, you can pick up a good soundbar under 100 dollars, which is a fraction of the price you might pay for a full blown surround system, so there are benefits to both. Although I’m not a professional sound technician, I do help out my friends and family with anything audio-related. I’m kind of their go-to guy when it comes to anything tech. So, I do get a lot of questions from my friends and family regarding soundbars, as it can be quite confusing getting to grips with what a soundbar actually does, why you might need one and the more technical terms associated with audio. So, here are the most common questions I’m asked about soundbars. Generally, a soundbar is used to amplify the sound for your television. People do use them for other uses, like for their laptops, or just as a general speaker that they can use with their phone or iPod. In a more technical sense, a soundbar is a wide-spread speaker that’s designed specifically to produce sounds that will flow throughout your whole room. Whilst it might not be as efficient as separate speakers, it is easy to fit under your television which is of importance to save space in your living room. Though I haven’t featured any soundbases in this post, they are actually a pretty decent idea. Essentially a soundbase is just a soundbar, but it provides the base for your television to lean on. The main reason I haven’t featured any soundbases is that they don’t have the same versatility as a soundbar. With a soundbar, you can use it for other things, like playing music. Soundbases are specifically designed to be placed under your television, which I think compromises their multi-use. Although it does look a bit complex, it’s actually really easy to work out what this means. So, this is a pretty confusing question that many people get caught up on. More wattage means more power, right?Well, yeah kinda. Depending on the sensitivity of the speakers, a 200W soundbar might be able to produce for power than a 300W soundbar. So if you’re wondering about what wattage soundbar you should buy, I wouldn’t pay too much attention to this. If you don’t have an optical cable, then you’ll want to use the HDMI cable. For the majority of soundbars, this should be sufficient to connect between your television and your soundbar. If you do have an optical cable, then it should be pretty straightforward to see how to connect your soundbar to your television with an optical cable. You’ll want to connect one end of the cable to the audio jack, which is usually placed beneath your television.With the other end (the Optical Out end), you’ll want to connect that to your soundbar. This should work, but remember you might have to change the settings on your soundbar itself. Whilst your instructions that you get with a mount should be fairly clear on how to mount a soundbar, this isn’t always the case. You should get a guide, or a template, that comes with your soundbar mount. If not, you can visit the manufacturers website to request this. Make sure that the soundbar is flat using a spirit level, and mark some holes on the wall where you’d like to place your screws. Once you’ve marked exactly where you want to put your screws, you’ll then want to drill into the wall with the correct drill bit size for the screws that you’ll use. You can then place the mounts into the walls, and use the screws to keep the soundbar mount in place. Don’t forget to test the soundbar mount before you use it!